At the turn of the century, the names of Nimschke, Helfricht and Young signified mastery in the art of firearms engraving in what has come to be known as American Scroll Engraving. This century, Michael Gouse continues the traditions of fine firearms in the styles of the American masters as well as offering English or, Germanic Relief, Arabesque, and Unique Custom Design to your specifications. Michael Edward Gouse engraves all these and more. He’s engraved Broomhandle Mausers in Relief Oak Leaves, Single Actions with brands from the owner’s surrounding area, retirement gifts for Law Enforcement Officers with their names and badges, military themes for servicemen, personally meaningful mottoes in insets surrounded by engraving. Upgrade your plain shotgun by adding your favorite dog and exquisite scrolling. Michael Gouse is factory engraver for High Standard, Lone Star Rifle Company, Ballard, Triple M Gun Works, American Hunting Rifle, and custom shops such as Oglesby & Oglesby. 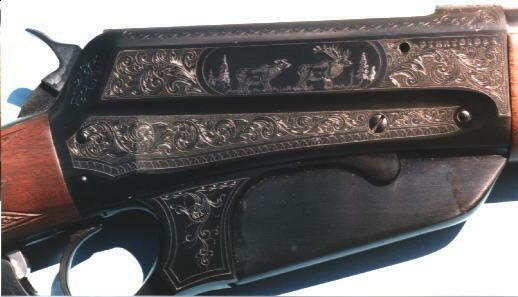 We offer Letters of Authenticity attesting to the fact that Michael Gouse personally engraved your firearm.